In the previous few posts we discussed the fundamentals of Uniform Linear Arrays (ULAs), Beamforming, Multiuser Detection and Massive MIMO (, , , ). Now we turn our attention to more complicated array structures such as rectangular, triangular and circular. We still assume each element of the array to have an isotropic or omni-directional (in the plane of the array) radiation pattern. The mathematical models for more complicated radiation patterns are an extension of the what is developed here. 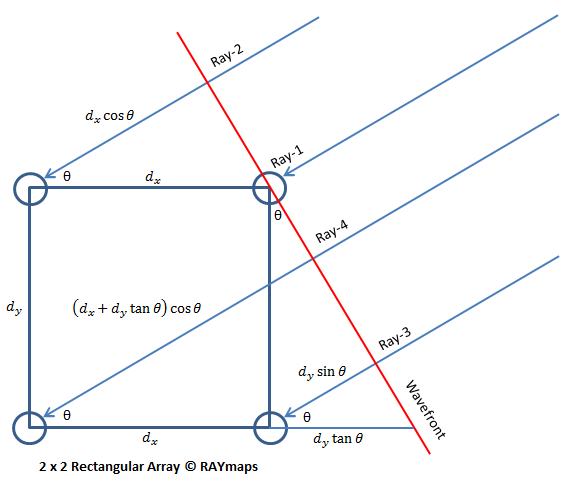 In this post we consider a square array which is a special case of rectangular array. We build up from the most basic case of a 2 x 2 array and derive the equation of the resultant signal, which is simply the summation of the individual signals received at the four array elements. Later on we give the MATLAB code which can be used to plot the radiation pattern of any size rectangular array. Lets consider a plane wave impinging upon a 2 x 2 receive array. The source is considered to be in the far field of the receive array making the plane wave assumption to be realistic. The equations for the received signal at the four array elements are given below. Please note that since the combined signal only depends upon the relative phase of the four components we assume the phase at the wavefront (red line in the figure below) to be zero. Also note that we have assumed that dx=dy=d. The range of n and m is 0 to N-1 and 0 to M-1 respectively. In the above code we have assumed a carrier frequency of 1 GHz which gives us a wavelength of 0.3 meter. The element separation along the x and y axis is assumed to be 0.1 meter (lambda/3). The total number of elements is 8 x 8 = 64. The maximum gain obtained is equal to 8 on the linear scale or 9 dB on the logarithmic scale. The radiation pattern has four peaks which does not make this array structure to be of much practical use. More complex array structures resulting in more desirable radiation patterns will be discussed in future posts. Please note that we have simplified the problem significantly by assuming an omnidirectional pattern of the array elements and plotting the composite radiation pattern only in the plane of the array. 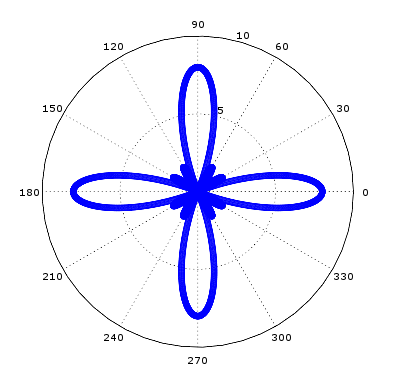 In reality the array elements do not always have an omnidirectional radiation pattern (one popular antenna that does have an omnidirectional pattern is a dipole) and we have to plot the 3D pattern of the array (or cuts along different planes) to get a better understanding of the characteristics such as Half Power Beamwidth, First Null Beamwidth and Side Lobe Level etc. More on this later.